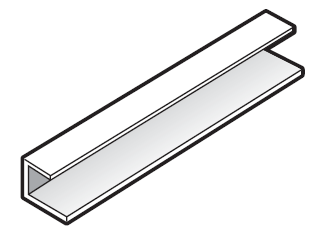 FloPlast White J Trim / Soffit Edge Trim - 5m length. (This products is also avaliable in a Woodgrain effects of Rosewood, Black Ash and Golden Oak. Please see our other fascia and soffit sections for these colours). These FloPlast plastic soffit trims are designed for use with the FloPlast Hollow Soffits, FloPlast Solid Soffits and FloPlast Vented Soffits. These can be used as an edge trim to cover an exposed edge of a soffit board or as a starter trim when fixed onto battens mounted onto the wall and the soffits slid into them. For fitting recommendations/technical specifications for these plastic FloPlast fascia products please see our Installation and Technical Information page.